At the foot of Mount Parnassos, within the angle formed by the twin rocks of the Phaedriades, lies the Pan-Hellenic sanctuary of Delphi, which had the most famous oracle of ancient Greece. Delphi was regarded as the centre of the world. According to mythology, it is here that the two eagles sent out by Zeus from the ends of the universe to find the navel of the world met. The sanctuary of Delphi, set within a most spectacular landscape, was for many centuries the cultural and religious centre and symbol of unity for the Hellenic world. The history of Delphi begins in prehistory and in the myths of the ancient Greeks. In the beginning the site was sacred to Mother Earth and was guarded by the terrible serpent Python, who was later killed by Apollo. Apollo's sanctuary was built here by Cretans who arrived at Kirrha, the port of Delphi, accompanied by the god in the form of a dolphin. This myth survived in plays presented during the various Delphic festivals, such as the Septerion, the Delphinia, the Thargelia, the Theophania and, of course. 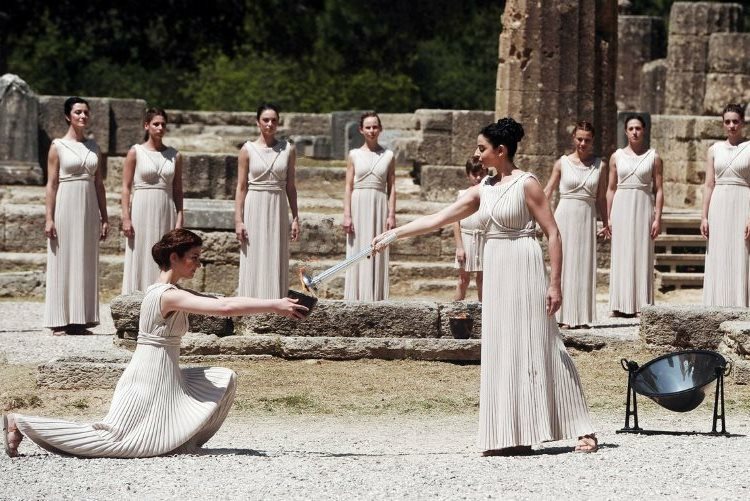 the famous Pythia, which celebrated the death of Python and comprised musical and athletic competitions.